There's a lot of bad stuff in this group's repertoire. Try, for example, starting a 10-mile bike ride listening to Chinese Democracy. Kinda gets you pumped for the first few minutes, but quite painful by the time you reach your destination. Nevertheless, the good stuff is really good. Interesting you chose today to post this because last night I happened to catch a bit of the Brett Michaels story on E! 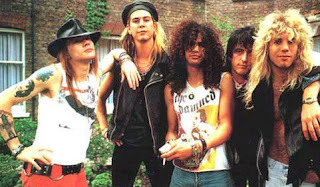 When Poison was being formed Brett really pushed to have Slash as their guitarist. Slash refused to put on make up and, thus, the other 2 members outvoted Brett to keep Slash out. What we would have missed out on, huh? I had never heard this before last night. On topic, my personal favs are Welcome to the Jungle and It's So Easy.